I’ve been meaning to read this for a while and finally took the plunge after getting to hang out with K.C. at RT a couple of weeks ago. 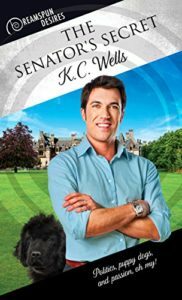 The Senator’s Secret by K.C. Wells was a wonderfully sweet, easy-going read that I absolutely loved. Senator Sam Dalton is running for re-election North Carolina. The campaign is running well until pictures of Sam and one of his volunteers hugging are plastered on the internet by Sam’s Republican opponent. The hug is innocent and meant nothing–but once it’s out there, it’s a campaign issue to be dealt with. The plan: announce that Sam and staffer Gary are actually engaged and wanting to keep that quiet until after the election so it’s not a distraction. For his time and trouble, Gary will get cash to cover his student loans so he can finish vet school debt free. What happens, as you’d expect for a romance novel, Sam and Gary fall for each other as they spend more time together. They’re a great couple from the get-go as they do things to be seen around town and telling their manufactured story. They make a great team, which easily evolves into a solid couple. They’re able to smack down the media that tries to proof they’re not really a couple. More importantly, they win over Sam’s parents. Sam and his parents are fun to watch, even as it starts bumpy because they learn about Gary–and that Sam is gay–through a press conference. Sam mom, in particular is a Southern spitfire and has some terrific scenes. This book was a perfect Dreamspun Desire with it’s low angst romance, a very timely topic and an awesome couple at it’s center and it’s highly recommended.